There are several small changes the CDC recommends to help prevent falls. Staying on top of your physical health is also important when you’re trying to reduce your risk of falling. Being able to see tripping hazards is very important, so make sure to keep up with your annual eye checkups and update your eyeglasses prescription as necessary. You should also ask your doctor or pharmacist to review the medications you take. Some medicines have side effects, such as dizziness, that may increase your risk of falling. Building up your strength and balance through exercise is a great way to reduce the risks of a fall. When starting a new exercise routine, many people attempt to dive in headfirst, but trying to do too much too fast can be unproductive. It can lead to serious injury or cause you to fall once again. Start only with what you can comfortably manage, then slowly add on to increase the intensity of your workout. When it comes to physical fitness, the journey matters so much more than your starting point. Many people get discouraged by how “little” they can do when they first start to exercise. It can be especially discouraging if your starting point is below what you could comfortably manage before your previous fall. Try not to let this bother you any longer. Accept where you are at right now, and take the necessary steps to improve your physical health. You might not be able to stretch as far or walk as long as you would like to right now, but don’t fret. In time, you’ll be able to look back and see the progress you have made with your balance, strength and endurance. 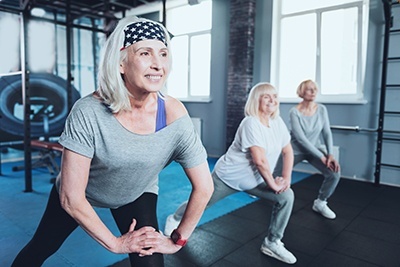 At the YMCA of Southern Nevada, we offer an Active Older Adults (AOA) program that helps you stay in shape, meet new people and have fun. This program is filled with fitness and social activities you’ll love. Participate in group exercise classes, such as Zumba Gold, Tai Chi and water aerobics. Visit any of our locations or contact us online today for more information.